The white man’s burden never eases. Long after the sun set on colonial empires, the rich nations of the world who make the G8, the smallest and most powerful club of their group, are preparing for yet another onerous task. After redrawing regional boundaries, creating a host of new nations and bringing democracy to dark corners of the world in the last century in return for their treasury of natural resources, the new powers have launched a new crusade. 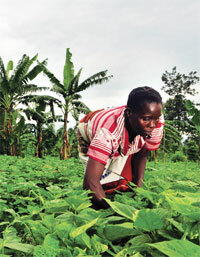 This is to lift 50 million Africans out of poverty in the next decade, primarily by setting right their agriculture. Virtuously called The New Alliance for Food Security and Nutrition, this neo-colonial enterprise is apparently all about G8’s commitment “to expand Africa’s potential for rapid and sustainable agricultural growth”. Governments of these countries - the US, UK, Germany, France, Italy, Canada, Japan and Russia - will provide funding of sorts to those African nations willing to join up but the true saviours will be private companies, many of them the multinationals who dominate the global seed and pesticides business or control the trade. Private companies are expected to pour in about $3.5 billion into countries where poverty and hunger are endemic. And among the line-up of companies that have signed the Private Sector Declaration of Support for African Agricultural Development are the usual suspects: Archer Daniel Midlands, Bayer CropScience, Cargill, DuPont, Monsanto, Syngenta and Yara of Norway. Close to four dozen companies are involved in this project - admittedly not all are multinationals but include small companies from the developing world - and clearly they are looking for rich pickings. The New Alliance was set in motion in May 2012 at the last summit of G8 in Camp David, and its cheerleaders are Barack Obama and acolyte David Cameron of the UK who is seeking to cover himself with glory with his campaign to end hunger at the just-concluded G8 summit in Lough Erne, Northern Ireland. How different are the Lough Erne and the 2012 Camp David summits from the Berlin conference of 1884-5 when the great powers of that era thought up a similar project. Under the cloak of liberating the Dark Continent from slavery, the European empires (with the US going along) were in effect deciding the carve-up of Africa among themselves. It is a toss-up as to which of these is the more cynical exercise. In the 19th century, the big powers rushed to grab the resources and territory of Africa for their territorial ambitions; in today’s scramble for Africa it is about ensuring corporate control over land and resources in those very nations. And yet, there is a desperate readiness by African countries to sign up for the promised benefits. So far, nine countries, Nigeria, Benin, Malawi, Ghana, Burkina Faso, Ivory Coast, Ethiopia, Mozambique and Tanzania, have joined the alliance with a simple price for entry. This is a commitment that they will ensure major changes in policy to facilitate investment opportunities and trade. Ivory Coast and Mozambique, for example, have agreed to pass legislation to promote partnerships that will “facilitate access to land for smallholder farmers and private enterprises”. Vast numbers of farmers in Mozambique have lost their land and in Ivory Coast, a huge displacement is expected with French, Swiss, Singaporean and Algerian companies signing deals for over 600,000 hectares. The most egregious example is Ethiopia which has already leased around 4 million hectares to foreign companies. The lives of hundreds of thousands of small farmers are at stake. But land alone is not the issue; these countries will also have to change their seed and food trade regulations. Mozambique has agreed to “systematically cease distribution of free and unimproved seeds”, paving the way for private companies to bring in their patented varieties once these country pass legislation granting intellectual property rights on seeds. In short, the conquering armies of the past have been replaced by subtler forms of appropriation-through legislation and contracts signed by compliant regimes. That is the tragedy of Africa. History repeats itself.